A suspected car thief in San Francisco was prepared to take his own life on Wednesday after he was cornered by police. The man climbed out onto a ledge and threated to jump. Police spent three hours trying to talk the man down from the ledge. At that time his family showed up with his cat. Within 45 minutes of the cat’s arrival, the man was talked down. “Using his pet, hostage negotiators were able to persuade him to go back inside the building, come down the stairs and surrender without incident,” SF Gate said. 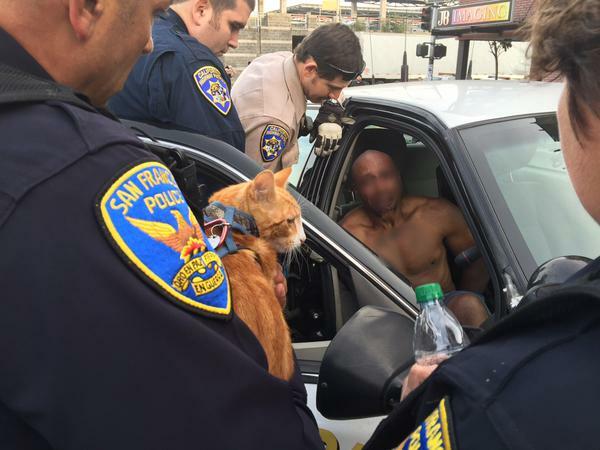 The police officers allowed the man to spend a few minutes with his cat before they took him in for questioning and likely some mental counseling.